Roller chain sprockets engage chain drives in power transmission and conveyor systems, though sprockets can engage any perforated material. Chain drives can produce a mechanical advantage as speed reducers/increasers. ISO sprockets are designed to engage British Standard Chain and conform to ISO standard R606. These sprockets are not interchangeable with ANSI defined sprockets. Roller chain sprockets are used in many power transmission drive systems as a continuous drive mechanism that can accommodate large center distances. Roller chain sprockets can be made from many different materials including steel, stainless steel, plastic, nylon, bronze, aluminum and many more. A rollar chain sprocket’s pitch is the distance between adjacent tooth centers. The outside diameter is measured from the tip of one tooth to the same point 180 degrees on the opposite tooth. 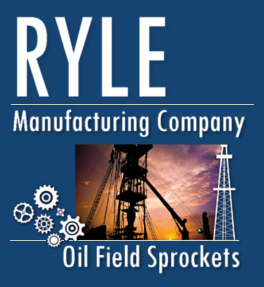 Ryle can deliver Roller Chain Sprockets from our huge inventory, or custom make to your specifications.